Fruitvale-area restaurant owners and legal pushcart vendors say they're being hurt by merchants who break the law, and the city is doing nothing about it. Just after 8 a.m., the stretch of sidewalk lining Fruitvale Avenue near East 15th Street is clogged as small groups crowd around three pushcarts, buying hot coffee, fresh fruit, and tamales. But across the street, Mi Grullense sits empty. Edgar Galindo, who runs the restaurant and tequila bar with his father, estimated that he has lost a third of his customers in the past year. Though he says the flagging economy is certainly to blame, Galindo also believes that the pushcarts are a large part of the reason he was forced to lay off several waitresses last year and put $80,000 of his own money into the business. Galindo is but one of many Fruitvale restaurant owners who say their revenues have dropped recently because of the pushcarts, many of which violate the terms of their peddling licenses and still more of which operate without licenses altogether. Joe Martinez, whose Golden Hours liquor store competes with the carts for sales of soft drinks and water, said he has "absolutely" seen profits go down. Ramon Peña, who owns Peña's Bakery No. 2, said sales of French bread, which the carts also sell, have declined. And Eva Saucedia, who runs another restaurant on International Boulevard, estimated that she has lost 50 percent of her business in the last year to a combination of the economy and the pushcarts. The restaurant industry has been among the hardest hit in the recession, and as the market gets smaller for everyone in Fruitvale, it appears that the pushcarts, which pay little overhead, charge lower prices, and often set up shop just yards away from restaurants, are drawing more and more customers away from brick-and-mortar businesses. And as the City of Oakland, which has suffered enormous staff cuts in the past year, fails to crack down on the numerous carts that violate their licenses or operate without them entirely, there appears to be no end in sight to Fruitvale's pushcart wars. 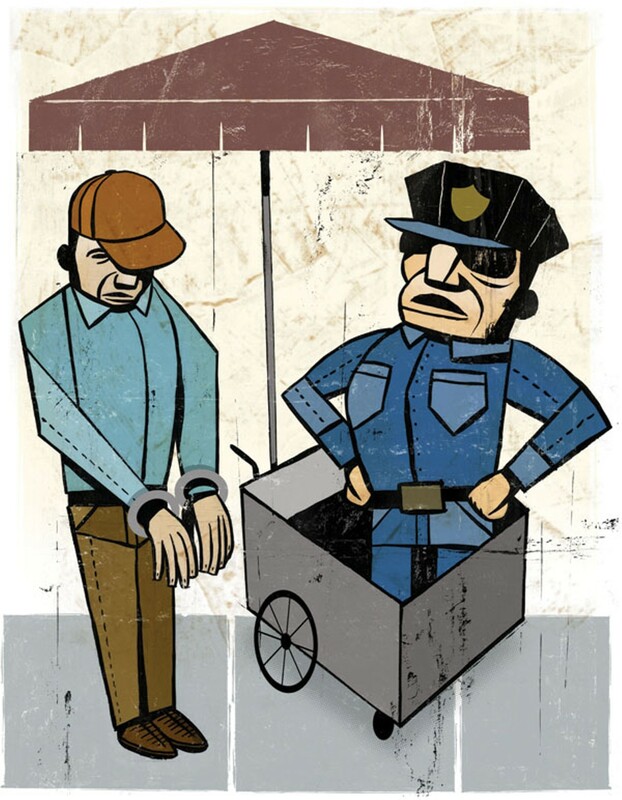 Pushcart vending was illegal in Oakland until 2001. But then a group of vendors using the name Asociación de Comerciantes Ambulantes de Fruitvale and led by community organizer Emilia Otero with the support of Councilman Ignacio De La Fuente, convinced the city council to pass an ordinance allowing for a small number of licensed pushcarts. The organization's goal, according to Otero, was to legalize and regulate a practice that was already alive and well, and provide a space and a set of tools for a handful of vendors — largely Mexican immigrants living below the poverty line — to start above-ground businesses. "This is bringing people out of poverty," Otero said. "It's putting food [on] many tables and saving many families." But now, twelve years after the association was formed and nearly a decade after the city made pushcart vending legal, the number of pushcarts has multiplied, as has the number of conflicts — between vendors and the city, vendors and restaurants, and vendors and each other. What began as a microbusiness venture has now become a large-scale competitive market whose ups and downs can have very real consequences for vendors and customers. It also appears that city resources can no longer match the outsize scale of the operation. Otero estimates that there are now 120 illegal pushcarts operating in Oakland — twice as many as the number that operate legally. She says that the illegal pushcarts are largely operated by a small group of vendors who aggressively take business away from legitimate carts and pay no fees to the city. "These pirates, they take our business away, and our carts are the ones who are paying," she said. "It's out of control. The pirates are doing whatever they want to do around the city." Jose Inestrosa, who operates a legal cart on 35th Avenue and International Boulevard, said that because unlicensed carts pay no taxes or fees, they can undercut his prices. And another licensed vendor, who refused to give his name for fear of conflict, said that while he sells tamales for $1.50, the unlicensed vendor who parks across the street from him sells them for $1 and has been slowly siphoning business away. "It's very bad," he said in Spanish. "It gets harder and harder." And perhaps worse is the potential for health-code violations presented by the illegal pushcarts, which, without the supervision of the Alameda County Health Department, operate largely out of homes. Otero said she has seen photographs of vendors slicing fruit in dirt- and fly-covered backyards and making tamales in kitchens with dirty diapers on the table. All of the unlicensed vendors approached for this story declined to comment. The conflict between licensed and unlicensed vendors runs deep and long, and has likely worsened in the recession. But it may not be just the unlicensed carts that are operating illegally. Galindo argued that many of the association's carts also violate city code by using carts that are larger than allowed and by failing to comply with the mandate that carts maintain a 100-foot distance from each other and allow for a clear pedestrian passageway. He also contended that they're violating a section of the city's ordinance that reads "Vendors shall not locate or create a vending activity that will negatively impact adjacent businesses or residences." "It's simple," Galindo said. "They're breaking the law." Indeed, during a recent visit to the area, several pushcarts — some with association decals, some without — were blocking the sidewalk and parking just feet away from restaurants while selling out of coolers despite the rule that all food must be contained within the cart. Otero denied that licensed pushcarts are violating the ordinance she got passed. "We follow the rules and regulations of the law," she said. "Those statements are totally selfish and untrue." She added that her vendors have never had a problem with the health department. "We make sure they comply with everything." Galindo said he has appealled to the city, with little luck. As it turns out, this is likely because of budget cuts and staff reshufflings in recent years, according to Chris Lewis, a construction inspection supervisor with the city. The cuts mean that the responsibility for managing complaints falls to three different departments in two different public agencies: Oakland's building and police departments, and the Alameda County Health Department, depending on the nature of the alleged infraction and where exactly it occurred. Moreover, there is no dedicated employee in the city who is tasked with inspecting and regulating the 200 or so legal and illegal pushcarts that speckle Oakland's sidewalks. "We've experienced a lot of loss of personnel over the past few years," Lewis said. "The people that are left are being asked to do more and more and being asked to do more outside the area of their expertise." A civil engineer by training, Lewis is the first to admit that he and his office "aren't very good at dealing with food vendors, and that's why it's the mess that it is." Many of Fruitvale's vendors and restaurant owners say that they just assume pushcarts aren't a high priority for the city. "They don't have enough time. They have more important things," the anonymous vendor said. For his part, Galindo doesn't understand why the city has failed to respond to his complaints. "I don't know why — my dad says the city told him they feel sorry for [the vendors], or they probably just don't have enough time," he said. "So it's hard to say. But the city hasn't done anything to help us out." Until they do, he said, he and his family are confident that they will continue to make things work, partly by cutting costs and partly by selling hot food from a folding table they've set up on the sidewalk in front of the restaurant. But even though the restaurant is not currently in danger of going under, what's clear from the looks of the empty restaurant and Galindo's face is that it's hard and getting harder for places like Mi Grullense to make ends meet.